This tree grows from 60 to 100 feet tall, and is 2 to 4 feet in diameter (sometimes much larger). The tree has an enlarged base, a massive straight trunk, and large, spreading, often crooked branches forming a broad open crown. The leaves are 4 to 8 inches long and wide, broadly ovate, with 3 or 5 shallow, broad, short-pointed lobes, and wavy edges with scattered large teeth. There are 3 or 5 main veins from a notched base. 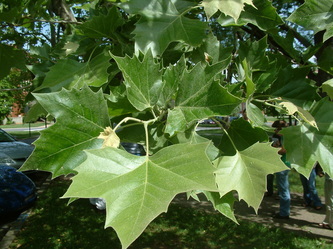 The leaves are bright green above, paler beneath, and becoming hairless except on veins, turning brown in autumn. 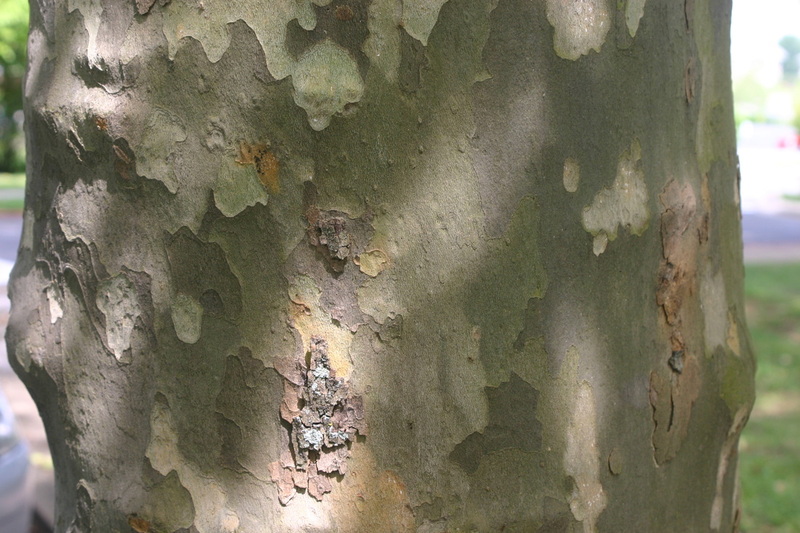 The bark is smooth, whitish, and mottled, peeling off in large, thin flakes, exposing patches of brown, green, and gray. The base of the large trunk is dark brown. The flowers are tine, greenish, in 1 to 2 ball-like drooping clusters. male and female clusters are on separate twigs. The fruit is 1 inch in diameter, and is usually 1 brown ball hanging on a long stalk, composed of many narrow nutlets with hair tufts. This is one of the largest eastern hardwoods. The Sycamore is used for furniture parts, millwork, flooring, and specialty products such as butcherblocks, as well as pulpwood, particleboard, and fiberboard. It has a larger trunk diameter than any other native hardwood. The present champion's trunk is 11 feet in diameter, and earlier giant was 15 feet. The hollow trunks of old, giant trees were homes for Chimney Swifts in earlier times. This tree is found in wet soils near stream banks, flood plains, and edges of lakes and swamps. It is dominant in mixed forests. It flowers in the spring, and the fruits mature in autumn.